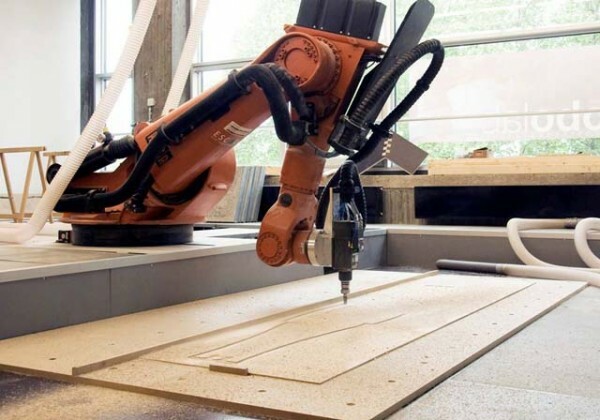 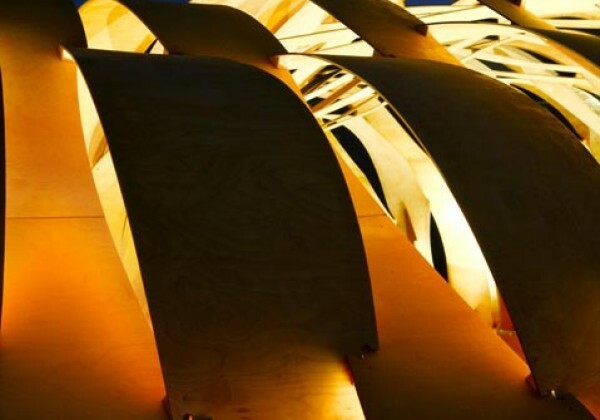 The innovative structure demonstrates the latest developments in material-oriented computational design, simulation, and production processes in architecture. 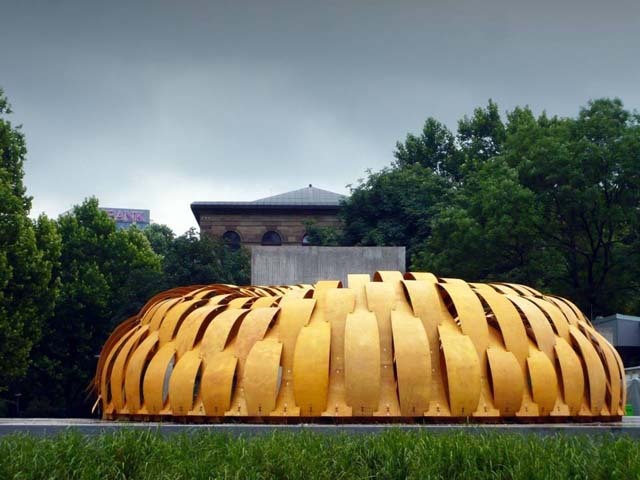 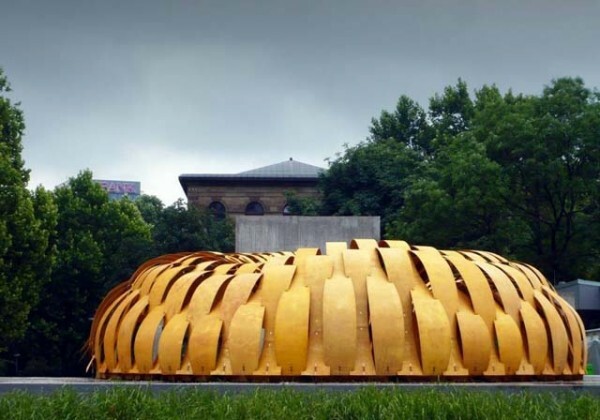 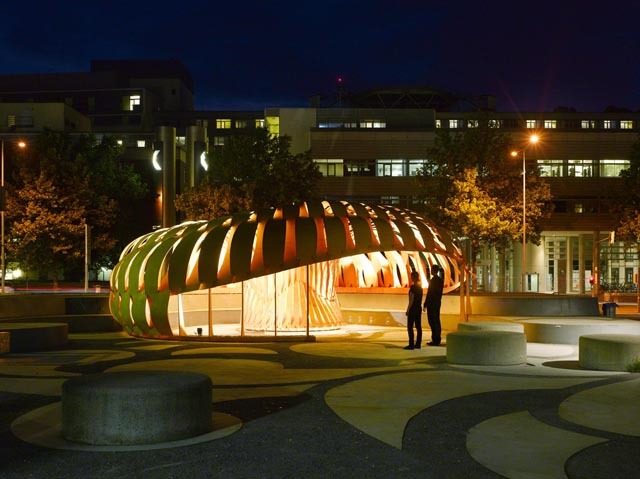 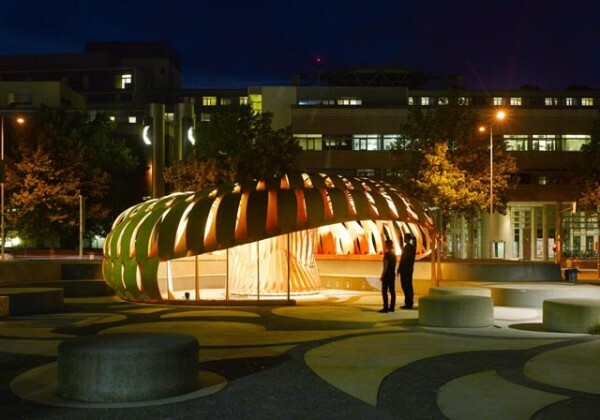 The result is a bending-active structure made entirely of extremely thin, elastically-bent plywood strips. 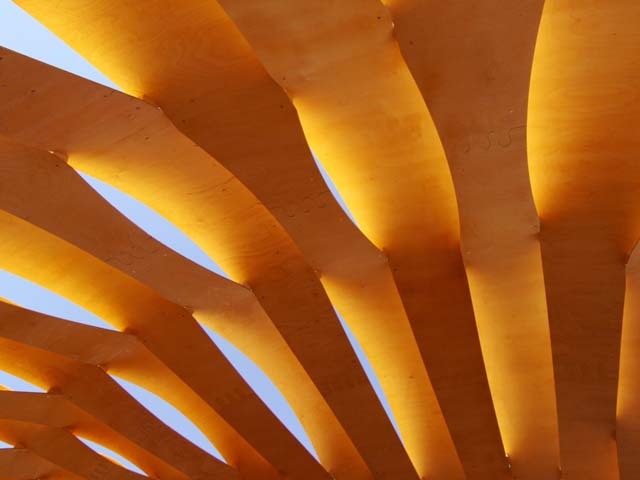 Any material construct can be considered as resulting from a system of internal and external pressures and constraints. 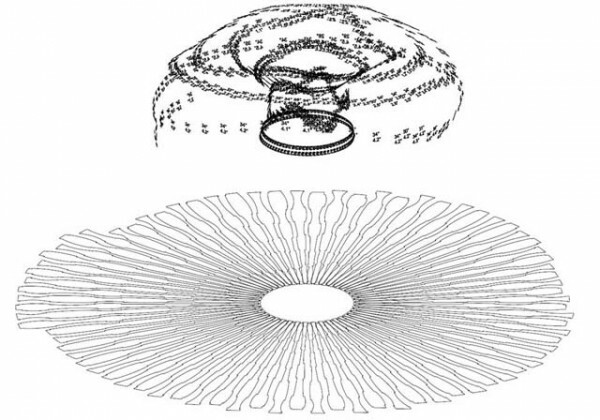 Its physical form is determined by these pressures. 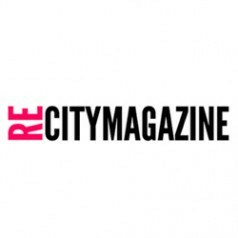 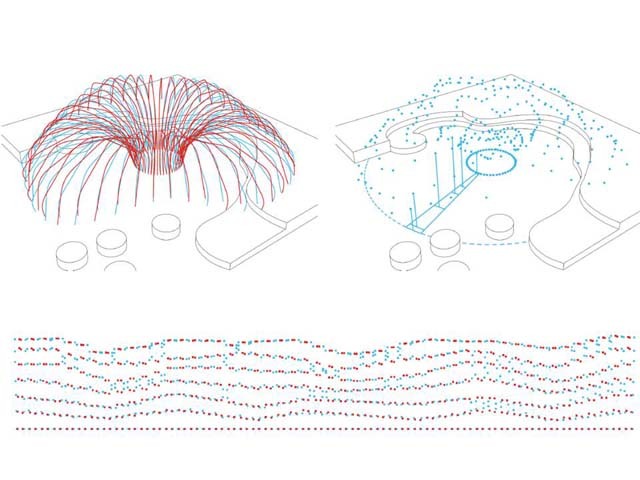 However, in architecture, digital design processes are rarely able to reflect these intricate relations. 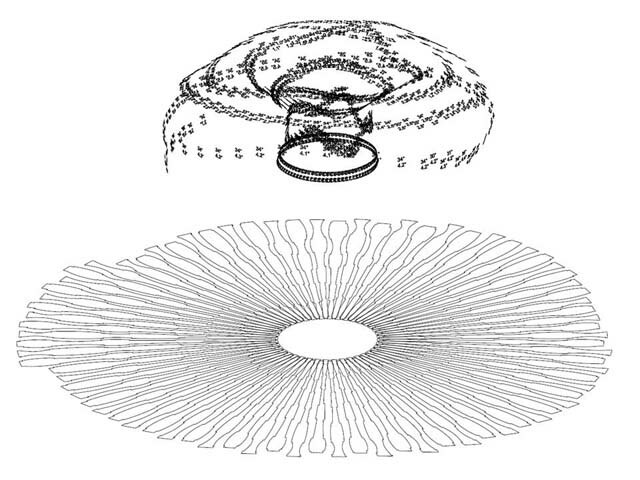 Whereas in the physical world material form is always inseparably connected to external forces, in the virtual processes of computational design form and force are usually treated as separate entities, as they are divided into processes of geometric form generation and subsequent simulation based on specific material properties. 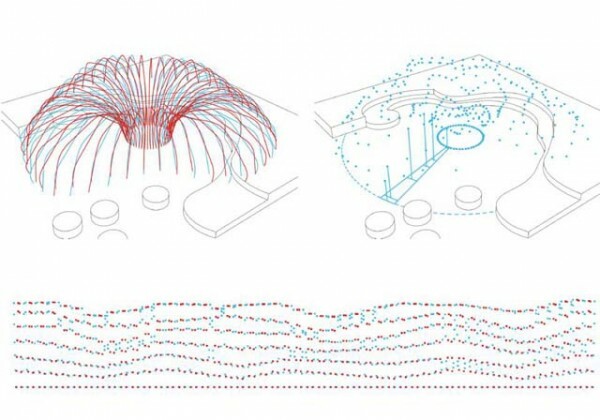 The research pavilion demonstrates an alternative approach to computational design: here, the computational generation of form is directly driven and informed by physical behavior and material characteristics. 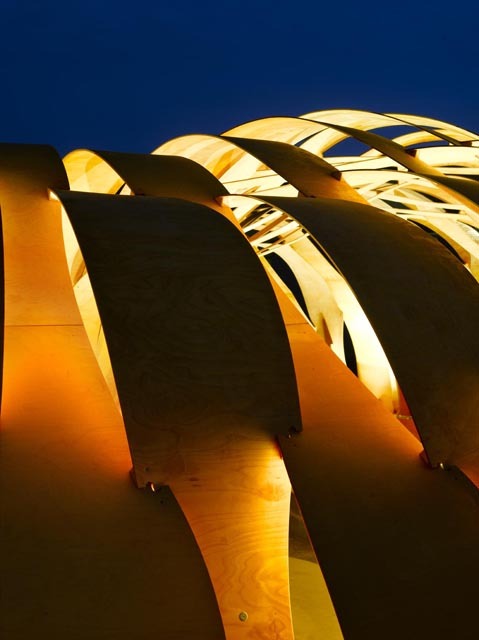 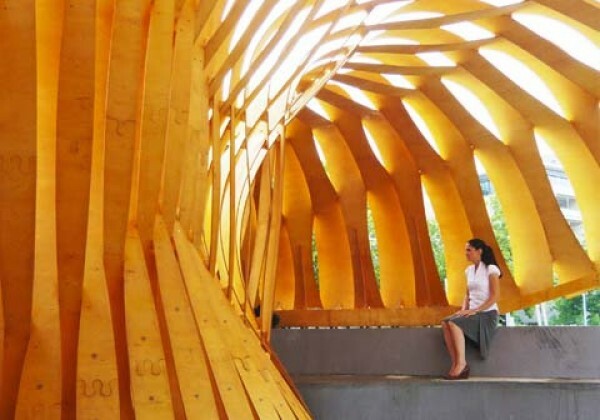 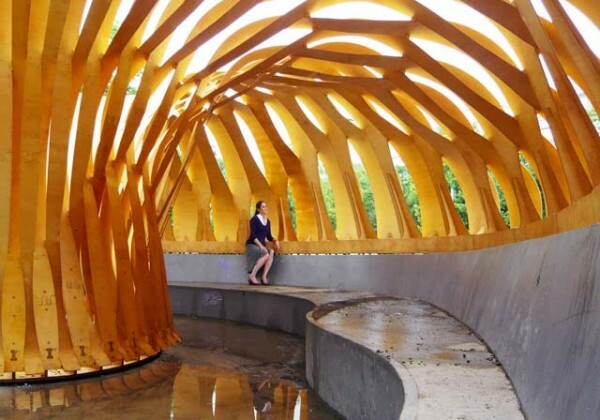 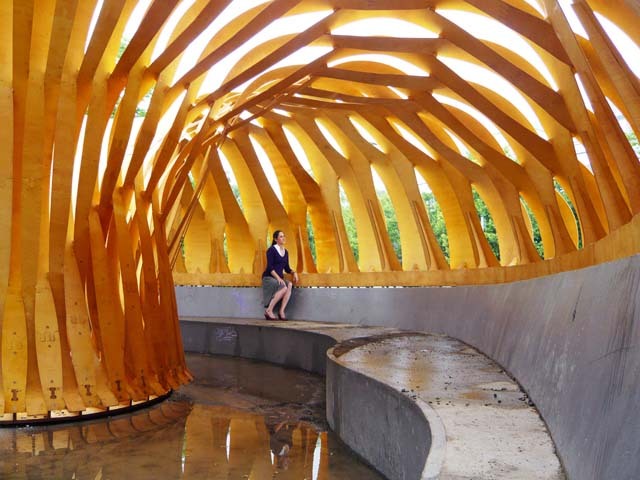 The structure is entirely based on the elastic bending behavior of birch plywood strips. 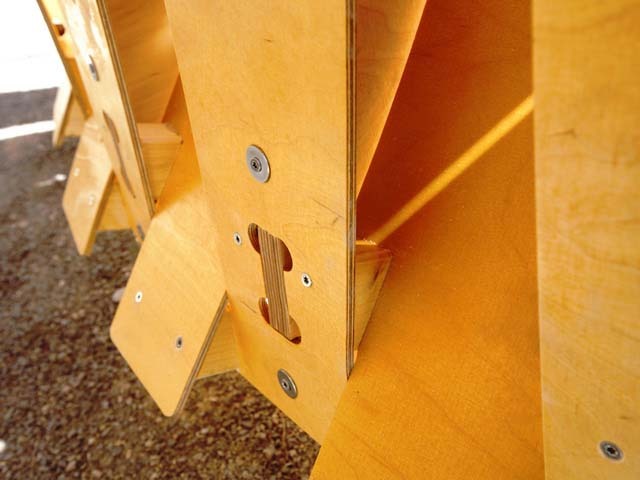 The strips are robotically manufactured as planar elements, and subsequently connected so that elastically bent and tensioned regions alternate along their length. 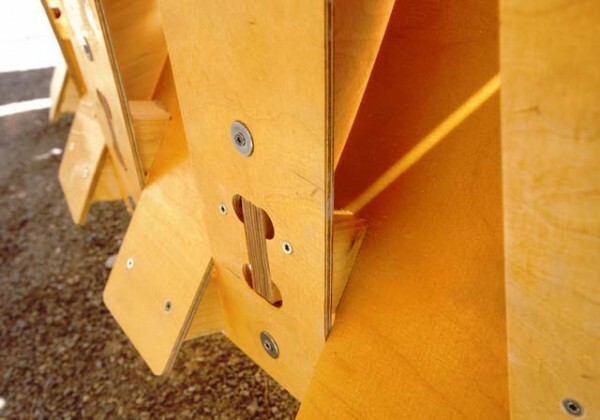 The force that is locally stored in each bent region of the strip, and maintained by the corresponding tensioned region of the neighboring strip, greatly increases the structural capacity of the system. In order to prevent local points of concentrated bending moments, the locations of the connection points between strips needs to change along the structure, resulting in 80 different strip patterns constructed from more than 500 geometrically unique parts. 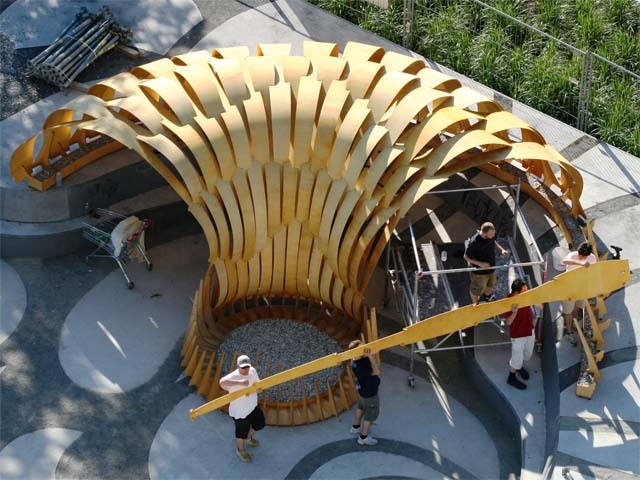 The combination of both the stored energy resulting from the elastic bending during the construction process and the morphological differentiation of the joint locations enables a very lightweight system. 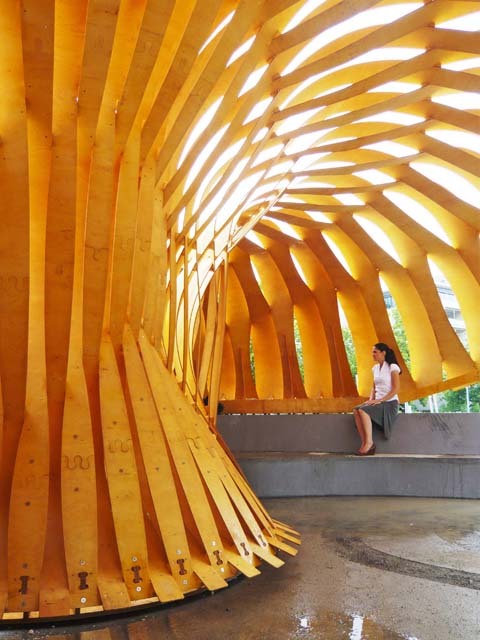 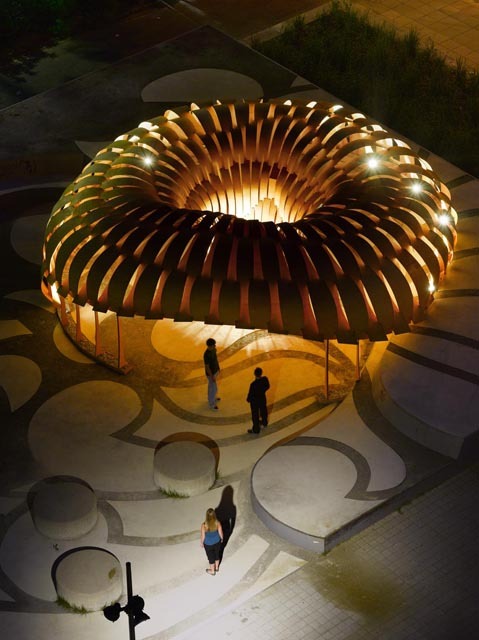 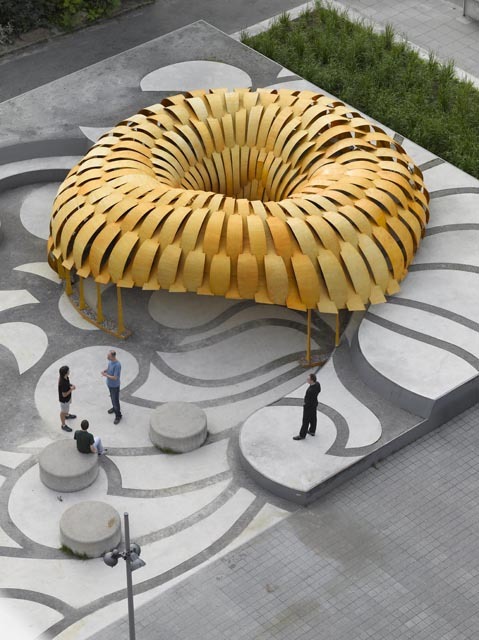 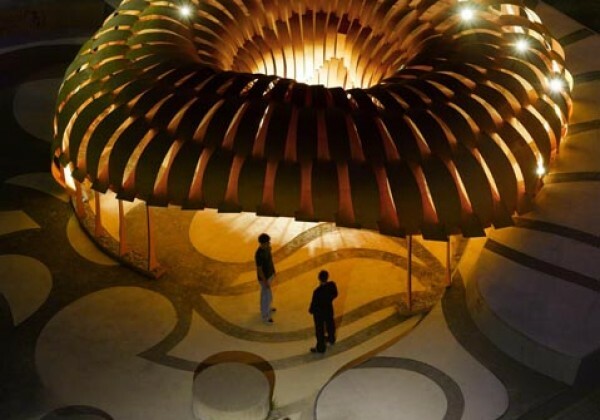 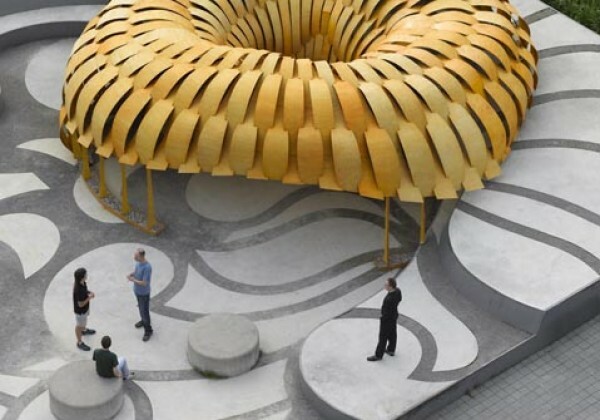 The entire structure, with a diameter of more than twelve meters, can be constructed using only 6. 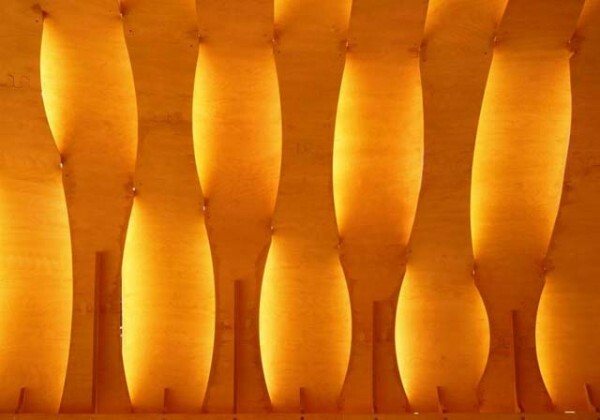 5 millimeter thin birch plywood sheets. 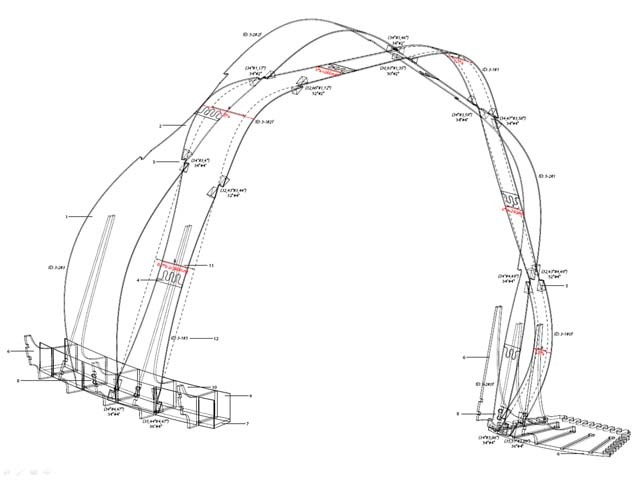 The computational design model is based on embedding the relevant material behavioral features in parametric principles. 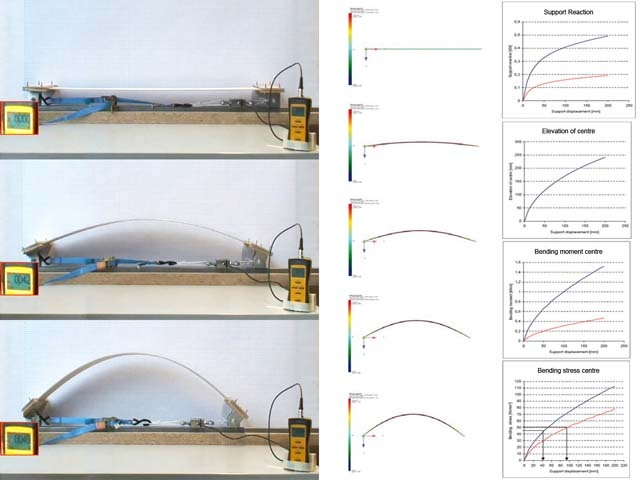 These parametric dependencies were defined through a large number of physical experiments focusing on the measurement of deflections of elastically bent thin plywood strips. Based on 6400 lines of code one integral computational process derives all relevant geometric information and directly outputs the data required for both the structural analysis model and the manufacturing with a 6-axis industrial robot. 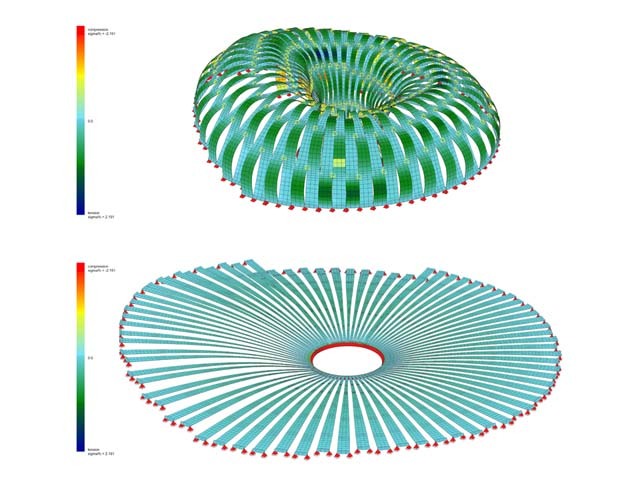 The structural analysis model is based on a FEM simulation. 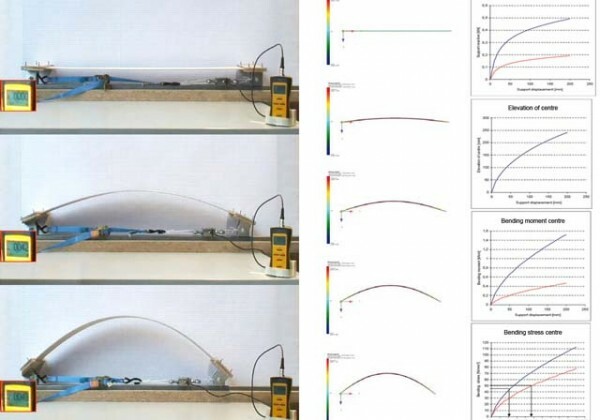 In order to simulate the intricate equilibrium of locally stored energy resulting from the bending of each element, the model needs to begin with the planar distribution of the 80 strips, followed by simulating the elastic bending and subsequent coupling of the strips. 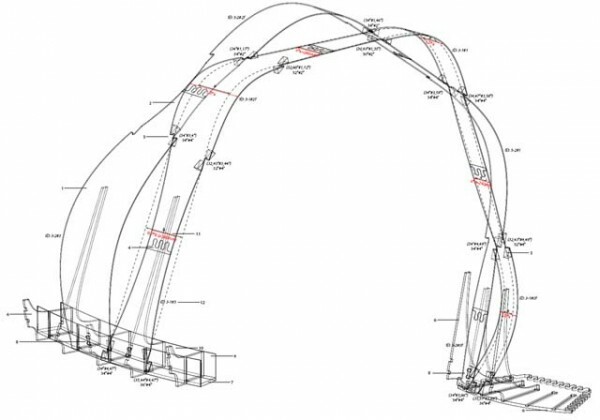 The detailed structural calculations, which are based on a specifically modeled mesh topology that reflects the unique characteristics of the built prototype, also allows for understanding the internal stresses that occur due to the bending of the material in relation to external forces such as wind and snow loads, a very distinct aspect of calculating lightweight structures. 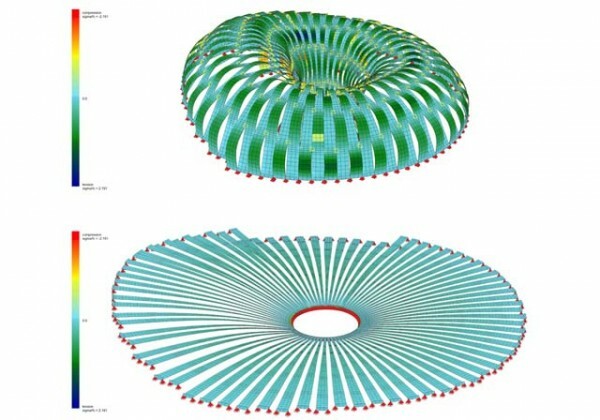 Comparing the generative computational design process with the FEM simulation and the exact measurement of the geometry that the material computed on site demonstrates that the suggested integration of design computation and materialization is a feasible proposition..